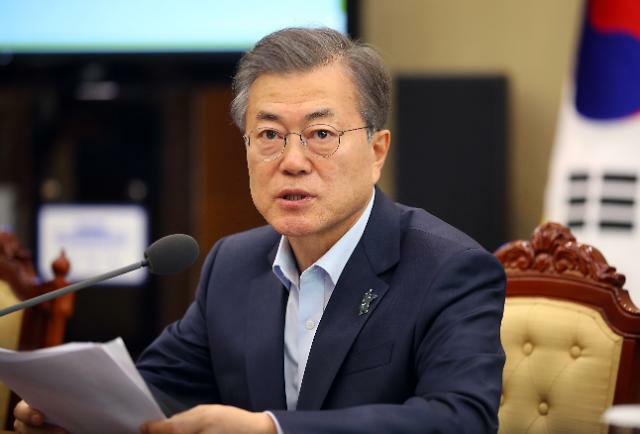 SEOUL -- President Moon Jae-in ordered stern administrative action Thursday against 226 workers who landed jobs at Kangwon Land, the operator of a state casino resort for South Koreans, through illicit means. Moon's order came amid growing public calls for the elimination of irregularities in job recruitment. The liberal leader has promised to introduce a fair society by eradicating corruption and wrong practices. On Thursday, Moon called for quick measures to root out employment-related corruption at public organizations, saying public company chiefs who are passive in carrying out his order should take responsibility, the president's office said. The government decided to sack all 226 workers who were illegally employed at the popular casino resort built in an abandoned mine town in Jeongseon some 170 kilometers (105 miles) east of Seoul. It is the only casino open to South Koreans. Public and state-funded companies have been probed to see if there are any job favors involving the children of influential politicians and businessmen. Financial Supervisory Service (FSS) head Choe Heung-sik stepped down this week over alleged hiring irregularities while serving as a commercial bank chief. Some banks have been accused of nepotism.